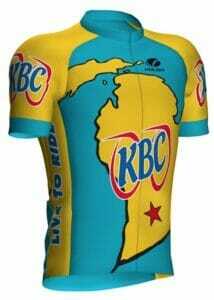 KBC Jerseys are BACK! Order Yours Now! KBC jerseys are once again available to purchase from Voler. The design is nearly identical to the club’s 2015 design, with the red star marking Kalamazoo, but with lighter blue sleeve edges and collar. Both men’s and women’s cuts/sizing are available. So…if you are new to KBC, or missed an opportunity to order a club jersey in the past, and have been wishing you could wear a KBC jersey while riding, your wish is about to come true. KBC Jerseys are available again! Order yours now and start wearing your KBC colors with pride! Cost is $77, shipping is free, and 20% of the purchase price will go to KBC’s Education Committee to fund projects like promoting the 5 Foot Rule and Bike Camp. Jerseys are ordered on Voler’s website. 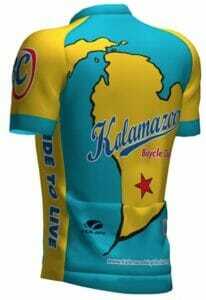 Click on this link https://www.voler.com/browse/collections/details/li/KalamazooBicycleClub to place your order. Once payment is confirmed, Voler will make your jersey and ship it to you. This very efficient process will take about one week, from order placement to shipping. Be part of a media event at the Kalamazoo Amtrak Station on Wednesday, 25 July, at 1:15 pm to kick off carry-on bicycles being accepted on the Amtrak Wolverine Service. Now all three of MDOT’s state-sponsored routes operated by Amtrak welcome carry-on bicycle service by reservations. In addition to the rail-fare, bicyclists can now make a reservation to transport their bicycles on the trains and stow them at the direction of the Amtrak conductors. There will be three more Tuesday Night Time Trials for KBC members on the following Tuesdays: July 17th and 31st and August 21st. Information about Tuesday Night Time Trials, provided below, can also be found in the “Tuesday” section of the Club Rides page of the KBC website. Click on this link to an Extra! Extra! Special Edition of PedalPress for a description of the final “championship” time trial of the season, on August 21st. Tuesday Night Time Trial – on a measured and marked 10-mile course – will be held (usually) on the 1st and 3rd Tuesdays of the summer, but watch for announcements and check the KBC calendar. Begin signing up at 6:30 PM and lining up at 6:45. Riders start at 30 second increments beginning at 7:00 PM sharp. The Tuesday Night Time Trial series is a great way to learn about riding and your own personal abilities. The best part of the time trial series is that everyone can participate – young and old, fast and slow – and you don’t compete with anyone but yourself. No pressure, except what you put on yourself. Come and find out just how fun a 10-mile ride can be and meet some old and new friends. Exciting and valuable weekly prizes (lol). The Tuesday Night Time Trial series is run by Team Clark Logic as a free service to all KBC members. You must be a KBC member to participate. No drafting. And, as at all other KBC rides, wearing a helmet is required!! Park at the Pavilion Township Hall, then ride south to the start line. Be sure to arrive on time to sign up and start at designated time.